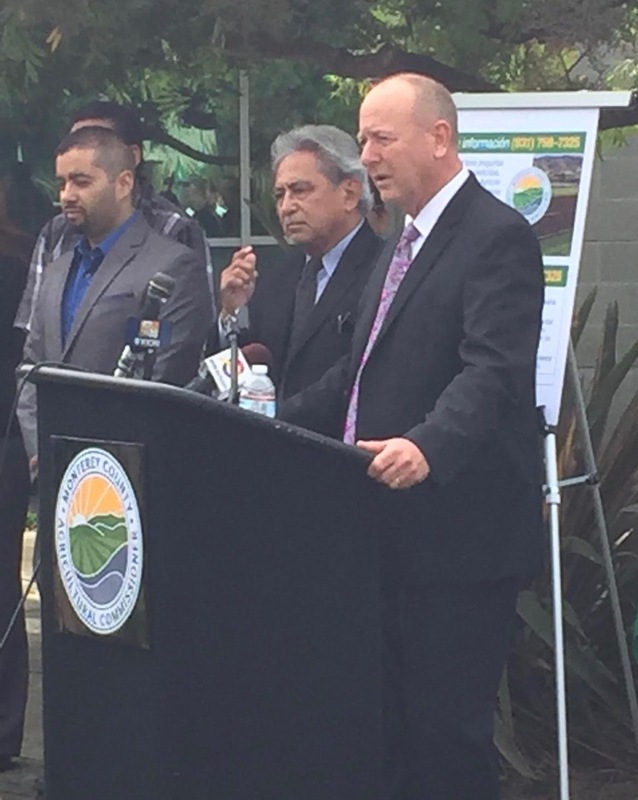 Monterey County Agricultural Commissioner, Eric Lauritzen and the Farmworker Advisory Committee, formed with the assistance of the Center for Community Advocacy (CCA), announced an historic initiative TODAY aimed at providing additional pesticide protections for farmworker safety. The initiative launches a pilot program with leading growers to enhance worker notification through warning signs when pesticides are used in the fields. Intended to protect farmworkers, the initiate “has created a relationship between our office, the regulators and the farm worker community,” said Lauritzen. “And it’s really building trust and confidence with our office and the regulatory program there to protect farmworkers,” noted Lauritzen. Additionally, every farmworker in Monterey County (approximately 50,000) will receive a business-card-sized information card (in Spanish) advising them to call the Agricultural Commissioner’s Office if they suspect violations of safety rules. The cards also advise employers that it is illegal to retaliate against farmworkers who seek the help of the Agricultural Commissioner’s Office. If you have questions or complaints on pesticides, the Monterey County Agricultural Commissioner’s Office will help. The card includes phone numbers and advises workers that state law also protects them against retaliation if they report a pesticide problem. Currently, regulations for posting pesticide warning signs do not require information indicating the date or time when it is safe for farmworkers to re-enter the fields. The pilot program will include the addition of one sign that will be prominently marked with a red flag and include the date and time that the law allows workers to safely reenter the field. Only the grower or his/her officially designated representative may remove the signs, after first showing the crew leader proof that the re-entry restrictions have expired. Growers involved with the initiative include Sea Mist Farms, Tanimura & Antle, Bayview Farms, Scheid Vineyards and Costa Family Farms. Lauritzen recognized these leading growers for their, support, innovation and dedication in their effort to provide additional protections for farmworkers. The accord reached two years ago between the Office of the Monterey County Agricultural Commissioner, the agency that oversees pesticide regulations and other worker safety matters, and the Center for Community Advocacy (CCA), a farmworker advocacy group, established the Farmworker Advisory Committee for the Office of the Agricultural Commissioner of Monterey County—the first of its kind in the State Of California.